3.4 Speak in the third person. Two often repeated cliches about EVE Online are worth mentioning, Don’t fly what you can’t afford to replace, and when you undock, you consent to PVP. In many ways, highsec is more dangerous than other areas of space. PVP in highsec is the most one-sided in the game. The mechanics of highsec appear to be designed to prevent attacks on players, but in reality, they create a level of predictability that allows attackers to enjoy almost complete control of the terms, circumstances, and timing of every engagement. Intel channels provide early warning of hostiles. Hostiles usually have to travel some distance. Standings provide strong indication of player intent, most alliances follow “Not Blue Shoot It” policies – anything not friendly is hostile. Hostiles don’t have anywhere to dock in someone else’s space. Defense fleets actively pursue hostiles. Mining with friends means mining attentively. Highsec is designed to be safer space, not safe space. The NPC police force CONCORD does not respond quickly enough to prevent a determined player from killing you, but CONCORD arrives and enacts swift retribution. Gankers minimize their costs by using disposable ships. In the case of ganking miners, the activity is rarely profitable, and other motivations apply, such as ideological opposition to the safety of highsec or AFK gameplay, revenge, recruitment, and personal entertainment. “Blingy” fittings can make you a lucrative target for gankers while adding only a marginal advantage – as a rule of thumb, don’t spend more than the hull is worth on a faction, deadspace, or officer module. A number of groups operate in high-security space that attack miners opportunistically, most notably CODE. and the Imperium’s Ministry of Love, which have a significant degree of overlap in their respective membership. If you mine in high-security space, chances are that you will encounter gankers sooner or later. The best way to avoid highsec gankers is simply to not mine in high-security space – the mining anomalies in nullsec are considerably more profitable for mining and if you do so as part of an established alliance, you will likely benefit from intel networks and defense fleets that provide a greater degree of safety as well as the ability to fight back – something the mechanics of highsec make near-impossible. If you must mine in highsec, be careful. Gankers focus primarily on inattentive pilots and high-yield ships because as your yield and ore bay capacity increase, your effective hit points decrease, making you an easier target. A Covetor or Hulk can often be obliterated in seconds by even a lone ganker in a disposable ship, Retrievers and Mackinaws are only a slight improvement – and poor fitting choices can throw away that EHP and make them just as vulnerable as a naked shuttle. Procurers and Skiffs are the ideal mining ships for highsec, provided you fit them to have as much tank as possible and maintain at least a reasonable degree of situational awareness. Properly fit, they are difficult, but not impossible to gank – a group with the manpower to target a well fit skiff could almost as easily take out a poorly fitted freighter, and will usually choose to do so. Where you fly is just as important as what you fly – the security status and the proximity to trade hubs has a huge impact on whether or not you will attract the attention of gankers. All the systems in close proximity to Jita and Amarr tend to be patrolled frequently by ganking groups. Be aware though, even backwater systems can occasionally draw in gankers if there’s enough activity in the area. While mining ships are rarely profitable to gank, haulers of all shapes and sizes are attractive targets. If you transport your ores to market yourself, use caution in doing so. Keep your cargo values low, your EHP high, and your head on a swivel, and you should be relatively safe. Use scouts to check local before your valuable cargo jumps into a system, and pay attention to both your surroundings and current events. A T1 industrial fitted for tank can carry around 50 million ISK before it’s likely to attract attention. A bulkhead-fitted freighter can expect to move around 1 billion ISK without notice. The odds of being ganked rise exponentially as you increase your cargo value and/or decrease your EHP. Ganking of haulers tends to be about profitability, Gankers use cargo scanners to find valuable cargo, and ship scanners to determine how their potential targets are fitted. If you fly smart, they’ll see you aren’t worth the effort and expense and tend to leave you alone. Expanded cargoholds may be tempting to reduce the number of trips you take, but your ship’s effective hitpoints are severely compromised by fitting for cargo capacity, so much so that gankers sometimes attack targets with cargo expanders simply for entertainment. It’s much safer to enlist couriers to move your goods, but this will cut into your profits. Provided you make your contracts with proper collateral, there’s very little that can go wrong, your goods either get there, or the hauler delivering them pays to replace them. Limited Engagements are a mechanic that is designed to ensure that if a player is attacked, they can always fight back. Taking legal aggressive action against a player with a suspect flag, criminal flag, or poor security status will create a limited engagement between you, allowing them to fight back without additional repercussions. A limited engagement lasts for 5 minutes from the last shots fired in that engagement. Limited Engagements may also be created by mutual agreement through the duelling option. Suspect baiting is a scam that exploits a player’s lack of knowledge of the game’s mechanics in order to be able to legally attack them without CONCORD intervention. The way it works is that the player will appear before you in a seemingly vulnerable ship with a suspect flag active – which allows you to legally shoot them, even with your safety green. However, because players are always allowed to fight back, it gives you a limited engagement with that player. From there, they either prove to be surprisingly well tanked, they attempt to change ships and engage you with a more powerful ship, or they might bring in neutral logi to give them the advantage. In any of these cases, you are probably dead. Can flipping may be done simply to steal from your jetcans, or it may be done as part of a suspect baiting attempt, in order to get you to commit to combat. As soon as they take from your jetcan, they will be flagged as suspect. Wardecs are a mechanic that allows one corporation or alliance to pay CONCORD for the right to freely attack another corporation or alliance for a period of time. While it provides a much-needed way for corporations to deal with inconvenient structures legally, wardecs are primarily used for griefing and by opportunistic bottom feeders. The easiest and most effective way to deal with wardecs is simply to drop corp or even disband as soon as one is threatened. You can rejoin after a waiting period, or when all wardecs are dropped. In some cases, dropping corp isn’t a good option – you may choose to fight rather than be bullied, or your corporation may have structures they wish to defend. In this case, it’s important to understand who your war targets are, what they want, and what their capabilities are. How big are they? What ships do they fly? Are they bottom feeders that just camp the Jita 4-4 undock? Are they a merc group that actively hunts outside of the trade hubs? Are they after a structure? Is the wardec a bluff? No matter who your enemy is, if you stay in corp during a wardec, it’s very important not to “feed” war targets easy kills or validate their behavior with an emotional response. Deny them any enjoyment, and they will likely go away in time. Fighting back is great, but do it when you have overwhelming odds, and not when it will produce “good fights”. You may be tempted to enlist a mercenary group to assist you. Carefully consider all your options and thoroughly investigate before hiring mercenaries – while a reputable group will help you for a fee, it’s not unheard of for the relationship with a less scrupulous group to turn into a protection racket once you are on their radar. Do I even need a player corporation? Mining isn’t taxable, so, you don’t actually need to be in a corporation to mine. However, you may find it convenient to do so for access to corporate hangars, standings that provide access to fleets or services, access to fleet hangars, access to ship maintenance bays, or because you engage in taxable activities like missioning on the same character. If you do nothing that benefits from being in a corporation, you can remain in an NPC corporation and be completely immune to wardecs. CONCORD response is activated the moment someone is in space, in a ship, with a criminal timer – meaning, they respond to aggressive actions once they have occurred. There’s a delay before they arrive, depending on the security status of the solar system. 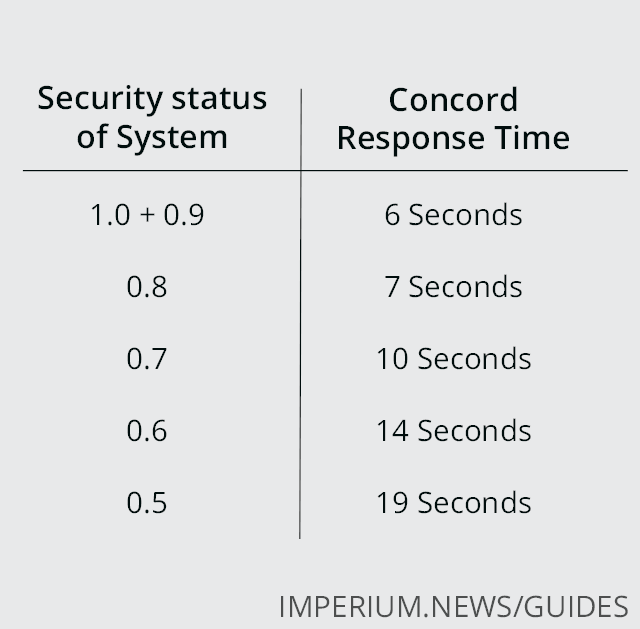 The fastest response is in 1.0 security systems, and the slowest is in 0.5 space. CONCORD monitors, but does not respond in 0.4 to 0.1 security systems. CONCORD doesn’t care who the aggressor is, only if the aggression is “legal” under the laws of CONCORD. In practice, this means you can’t defend yourself until after someone starts firing on you. The safety settings on your HUD correspond to CONCORD’s rules of engagement – a green safety will only allow you to activate modules in a way that is “legal”, a yellow safety will only allow you to activate modules in a way that gives you no more than a suspect timer, and a red safety will allow you free reign to take whatever action you wish, so long as you are ok with the consequences. As soon as a criminal timer is acquired from an aggressive act, the pilot’s ship is disabled from all actions that would allow it to escape CONCORD’s justice, and response forces will be summoned to destroy their ship. For the entire duration, they cannot warp, dock, eject, or jump through a stargate or wormhole, and the only way to board another ship is inside a station or citadel. The pilot’s pod is also freely attackable, but the pilot is free to warp, jump, or dock with their capsule. 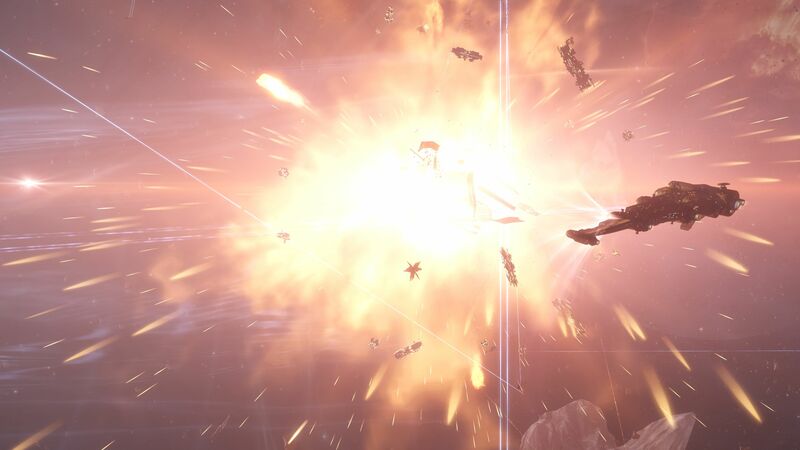 In practical terms, this means that there is no way for a ganker to escape the destruction of their ship and that any other ship they attempt to fly in high security space will be destroyed for 15 minutes. Null security space is often perceived as more dangerous than high-security space. While there are significant risks, a well-prepared pilot will find nullsec to be safer than highsec, provided that they have good situational awareness and take an active role in their own defense. The biggest advantage you have in nullsec is the existence of intel channels, and the clarity provided by standings and rules of engagement. Rather than having to guess which pilots in local might wish you harm, you have a very reliable “friend or foe” indication in the form of standings – any pilot not marked friendly can be presumed hostile. The other crucial difference is the possibility to take preemptive action to remove threats, a luxury CONCORD denies to the highsec pilot. For the unwary, there is some truth to the danger – a pilot who is unaware is certainly at more risk in nullsec than they would be in highsec. The first and most important aspect to nullsec survival is having an intel channel for the region of space you mine in. The Imperium has intel channels for each region we are active in, a listing of them can be found in Bread and Circuses – which is a coalition wide channel. Intel channels provide early warning of hostiles in the area and the ability to track their movements. It’s recommended that you have your regional intel channel open in its own window, where you can constantly monitor it for activity. Your local channel should also be open in its own dedicated window. Maximize the number of names you can see in local by making the window taller, and by activating compact member list. Local will also give you a strong clue as to where you should and shouldn’t be mining. If the member list has a scroll bar, it’s a sign that you either need to mine elsewhere or be on comms with your fellow miners – your ability to notice hostiles in local is severely compromised if you have to scroll to do so. In very populated systems, such as staging systems, it can be extremely dangerous to be alone in space – you won’t notice new hostiles quickly enough, and you may not get help in time. One thing that helps one notice new people (and hostiles) entering local is highlighting the list of people in local. If you select one name and press CTRL+A it selects everyone currently in local and when additional people enter the system they will not be highlighted. This makes it extremely easy to tell when new people have entered. It’s a good idea to be logged in for 5-10 minutes before you try to undock so that you can actually get a feel for the intel. Go grab a cup of coffee, and when you come back, look over the intel. You’ll have a clearer picture than if you just logged in and immediately undocked. Sovereignty provides a degree of safety – only friendly pilots have access to the stations and citadels in sov nullsec, meaning that any hostile entities have to stage themselves some distance away and travel through your space before reaching you. They must also leave after a time unless they want to commit their characters to staying in your space without the benefit of docking or resupply. There is safety in numbers, and standing fleets provide that safety, by allowing allies to quickly and easily warp to one another for mutual defense, as well as allowing capital ships to jump directly to someone’s aid – if they have a cyno fitted. Members of the Imperium operate several standing fleets. We’ve found through experience that the best practice for organizing standing fleets is to do so geographically, based on a central point and force projection from that point. Organizing standing fleets by location rather than corp/alliance membership makes achieving critical mass more likely. Additional standing fleets are only needed to add capacity, or to cover different areas of space. Plugging resist holes, and fitting a reasonable tank to your ship will potentially delay hostiles long enough that assistance can arrive in time to save you. This is most applicable to Rorquals and other large/expensive ships. 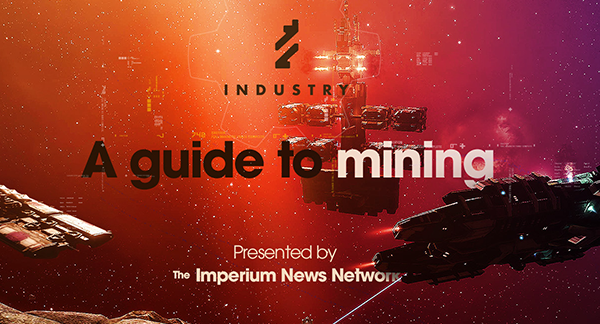 If you are mining with either a Procurer or Skiff, you frequently have the tank and increased drone damage to enable you to fight off small or singular attackers. If you are flying one of the other mining barges or exhumers, getting caught usually means getting killed as they rarely have enough tank to survive a combat encounter. Being on voice comms improves your chances of survival. You will probably be much more attentive chatting with friends than you would if you were just mining. Intel is sometimes shared in voice comms more quickly than it’s shared with intel channels, and being in comms already means you’ll be in the right place to ask for help. It’s absolutely critical that you pay attention to your alliance’s broadcasts, scheduled combat operations, and other alliance communications. All PVE activities in nullsec become considerably more dangerous during major operations. Intel becomes spotty, pilots become inattentive, critical mass is lacking from defense fleets, and ability to escalate is slim to none. If you are paying close attention to regional intel channels, you’ll get early warning of most hostiles, allowing you time to wrap up and get yourself to safety. If you choose to wait and see, make sure that you are in comms with your standing fleet, stay close to drones (or pull them in), and be prepared to warp out immediately. Anything sub-capital (mining barge, exhumer, Porpoise, Orca, Industrial) is not going to last very long against a hostile gang, but depending on what you are facing, you might have a chance against someone flying solo. Regardless, it’s best to just get out as soon as hostiles enter local. Warp to a citadel or POS, as it’s easy for bubbles to catch you on stations, and remain there until the coast is clear. Rorqual pilots should pull in their excavators immediately and either flee or prepare to fight. At this point, you should already be giving updates in comms. More on how not to die in a Rorqual. Say “check check” to get attention and signal others to clear comms. Repeat as necessary to get comms clear and then give your name, location, and a description of what’s going on at the very minimum. People can’t help you unless they understand what’s happening. “Miner McRoidface’s Procurer in NOL- is tackled by a stiletto.” Remember “me and I are going to die”. If you say “I’m tackled”, you are going to waste time and possibly throw away any chance of rescue. Keep calm and keep talking. Defenders need to know what’s going on. Remember to let them know if you have a cyno available. Similarly, if you are talking, and someone says “check check”, stop talking and listen. You’ll also hear the phrase “clear comms” – this is reserved for an FC or someone otherwise “in charge”, but has the same meaning. “www” is shorthand for “warp to me”. In a combat fleet, you use this to let the FC know you are offering a warp-in point they can use. In a standing fleet, it’s used to communicate to rescuers exactly which pilot they need to warp to and save. You simply type “www” into fleet chat at the same time as you are explaining what is going on, so that they won’t have to waste time finding you in the list of names. When you see “www” in fleet chat, keep fleet chat as clear as possible until the situation is resolved. Scrolling the chat with useless drivel when someone needs help makes it harder for people to right click on the right name. At the same time as you are communicating your plight to your standing fleet, abandon any subcap(non-excavator) mining drones, drop DPS drones, and put your drones on the tackler. Align out, overheat as necessary but be careful not to burn out tank. Light or medium drones will do high damage to fast tackle ships – if you can break the tackler before their gang arrives, you might get out. Generally, you should wait until directed to light a cyno – it immobilizes your ship for 10 minutes, and you may need to change fleets first so that responders can see the cyno. Since it takes up a valuable high slot, you probably won’t have one in a sub-capital mining vessel, unless you are baiting. A Porpoise or Orca can potentially fit one without interfering with mining, and haulers should probably always have one in nullsec. Make sure you are in the right fleet, that you have liquid ozone to fuel it, and that defenders are ready to jump in. If you accidentally light your cyno in the wrong fleet, do not change fleets – stay there and let rescuers know what happened, so that they can move into your fleet instead. A cyno will not continue to work if you change fleets – you’ll have to wait for it to cycle down and light it again, by which point you will be dead. If you are going to be dead within the next few seconds, or if a mobile cynosural inhibitor is going online, and you can’t wait, go ahead, light it, and call it out on comms. Make sure that responders know what fleet you are in, and if necessary, that they move over to your fleet to be able to use the cyno. Please note: Mobile Cynosural Inhibitors take 2 minutes to online, so you have up to 2 minutes to change fleets and light your cyno before you will be unable to do so. Remember quick thinking and having cynos fit to your support vessels can potentially get help to you in time to save your ship. Wormhole space is often, and correctly, perceived as the most dangerous space in which to do anything. While there is significant value to be found in wormhole PvE, those who engage in it must do so with the knowledge that they run a great risk and a lack of situational awareness will be their downfall. The greatest advantage a player has in wormhole space, as both hunter and hunted, is the extensive fog of war surrounding their actions and the ability to use misdirection to turn the tables in any given situation. The fog of war is also the greatest disadvantage to a player who simply wishes to mine Crokite or gas (commonly known as gas huffing). There is no free intel from local channels, and the nature of wormhole space makes seeing incoming hostiles all the more difficult. Do not let these warnings dissuade you from engaging in the exciting and challenging gameplay to be found in wormholes, rather, educate yourself and enter the strange mix of Mad Max and Space Samurai armed with knowledge. In wormhole space, the core activity is the scanning and scouting of connections between different wormholes. Everything in wormhole space builds from knowing what systems you are connected to and then knowing who may come to interrupt your activities. So, the first thing to do upon logging into or entering wormhole space is scan. Scan down all the signatures in the system you intend to be doing things in, then follow those links 2-3 jumps deep into the chain. This will build your map of the day, and inform you of your neighbors. If those neighbors are active entities who do a lot of PvP, it may be prudent to close off your connection to them in advance. In short: Scan, scan, scan, scan. Once you have a chain that doesn’t scream danger, then you can settle in to mine, huff, or run combat sites. There are two general camps regarding what to do with connections to other wormholes that you don’t intend to do things in. The most prevalent says you should crit the wormholes connected to your own – bring them to the very edge of collapse from lots of mass traveling through them. The more reasoned approach is to station a cloaked scout to watch each wormhole, to watch and listen for activations. Nor should the savvy pilot rely only on scouts – after all, human attention is limited and you can miss the sight or sound of an activation coming through an alt client, or the guy who volunteered to be a scout for a share of the payout might fall asleep, get distracted, or just quietly log off. The other tool falling into this category is the directional scanner. Bluntly: Always be d-scanning. If you’re not refreshing your d-scan frequently, then you’re not going to survive longer than it takes for a Proteus to decloak, lock you, and explode your ship. If you’re not flying solo, be on voice comms with your friend(s) so they can alert you to incoming hostiles. If voice isn’t an option, pay attention to chat. But, assuming that the inevitable enemy appears, what next? If your scout(s) manage to see them coming, or you spy an unknown ship on D-Scan for an instant, warp off. Get to a safe spot in space, or to your Citadel, and either cloak up or dock. If you’re cloaking at a safe spot, don’t just sit motionless – it’s possible to combat probe you down in the seconds between landing and cloaking if your ship can’t fit a covops cloak, so, cloak up and burn in an arbitrary direction not aligned with a celestial. If you get tackled, first: Accept that you’re probably done for. Most mining ships simply don’t have the tank to survive for long, save a Procurer or Skiff. Take a look at what is on grid with you and remember what ship you’re in. A Venture with a warp core stabilizer can escape from solo directed tackle that is applying up to 3 points of warp disruption, but anything more than that and you’re toast. If you’re in a Procurer or Skiff and tank fit, good job! Make them work for the kill. Apply those ECM drones (You have fitted them, right?) and pray they land a jam. If you manage to burn out of the bubble, shake off the tackle, or otherwise are free and clear to warp? DO IT. Get out of there, get safe, and cloak or dock. Be patient and wait for the hostiles to leave. Next up: What to mine?